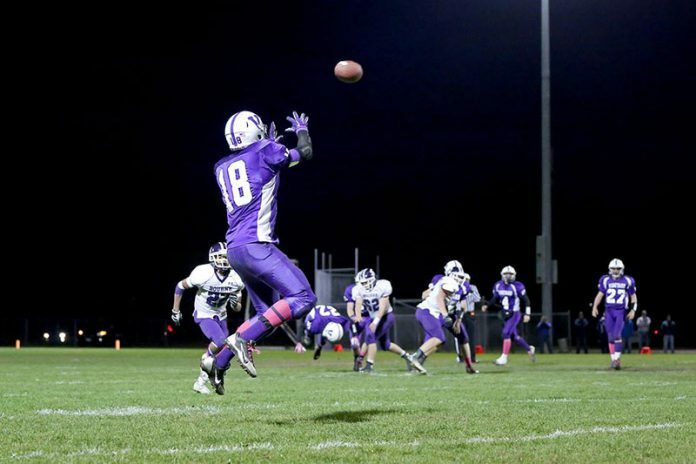 The Martha’s Vineyard Regional High School (MVRHS) Vineyarders ran big plays early and often to beat the Bourne High School Canalmen, 41-6, Friday night at Dan McCarthy Field in Oak Bluffs. After stifling Bourne on downs in the game’s opening possession, senior quarterback Mike Mussell unleashed a 39-yard strike to a wide-open sophomore James Sashin for the score barely two minutes into the tilt. James Sashin added the first of his six extra points for a 7-0 Vineyard lead. The Vineyarders took over on downs after the ensuing Bourne possession and on the first play from scrimmage, junior back Jacob Cardoza scored on an 80-yard burst up the middle for a 14-0 lead as a thin Halloween night crowd was settling into their seats shortly after MVRHS cheerleader Oshantay Waite sang the national anthem. The rejuvenated Vineyarder squad (3-5), which has won three of its last four games after an 0-4 start, has been piling up impressive numbers over the last two weeks. On Friday night, Mike Mussell was 5 for 7 passing for 158 yards with three TD passes as well as receiving a touchdown pass from James Sashin. Mike has 14 TD passes thus far this season. Juniors Jacob Cardoza and Ben Clark each scored twice. Ben Clark had 117 yards rushing to lead the team. Jacob Cardoza, with 101 yards rushing, also eclipsed the single season reception yardage record (576 yards) set in 1992 by Albie Robinson. The first half offensive onslaught continued with a 40-yard pass from Mussell to Cardoza and a 64-yard catch and run by Jacob Cardoza. Bourne scored on a 28-yard run by Dylan Kehoe. The point-after failed and the teams headed to the locker room with the Vineyarders leading 27-6. Ben Clark closed out the Vineyarder scoring in the second half with TDs in the third (24 yards) and fourth quarters (66 yards). Head coach Donald Herman, who has endured the worst start (0-4) in his 29 years on the Vineyard sidelines, said he was heartened by the effort on Friday night. While the Vineyarder offensive production was impressive on Friday night, Mr. Herman had kudos for his defense and the kicking game, featuring sophomore James Sashin whose punting work was impressive, including one booming 40-yard kick into a stiff wind. Bourne produced an effective running game which kept the quick-strike Vineyarders offense off the field for extended periods of time. Longtime Vineyarder fan Richard “Stoney” Stone, sitting gamely atop the bleachers in frigid conditions, offered this appraisal. “I think Bourne has had more time of possession than we have,” he said. In truth, Bourne did run the ball effectively against a Vineyarder defense that bent but didn’t break, coming up with big plays to stop the Canalmen four times on downs, including one series in which the Vineyarders tallied tackles for lost yardage on three consecutive plays. He noted that David is the only senior in the group. “We started some sophomores on Friday and we’ll start them again,” he said. Which bodes well for the future? “We need numbers. Overall the numbers are low,” he said. In fact, the Vineyarders suited up only 28 players on Friday night to face a 1-7 Bourne team with only 23 players in uniform. At halftime, a passing Bourne fan agreed. “It’s tough. You know, most of our kids have been playing together since Pop Warner and they’ve kept playing into high school,” he said. The Vineyarders play next Friday at Joseph Case High School in Swansea. The game against an 0-8 Cardinal squad begins at 6 pm. They meet Bellingham High School at home on November 14 before hosting Nantucket for the annual Island Cup matchup at 1:30 pm, Saturday, Nov. 22. The schools’ JV teams play at 10:30 am.